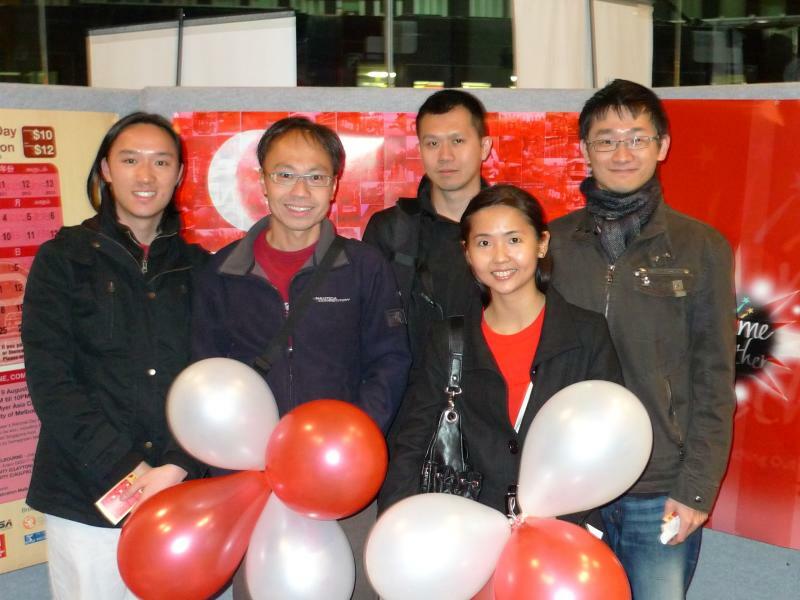 Thanks to the efforts of the Singapore Students Society at the University of Melbourne, together with counterparts at RMIT, University of Monash (Caulfield & Clayton), more than 500 Singaporeans and friends of Singapore had the chance to celebrate our country’s 44th birthday tonight. 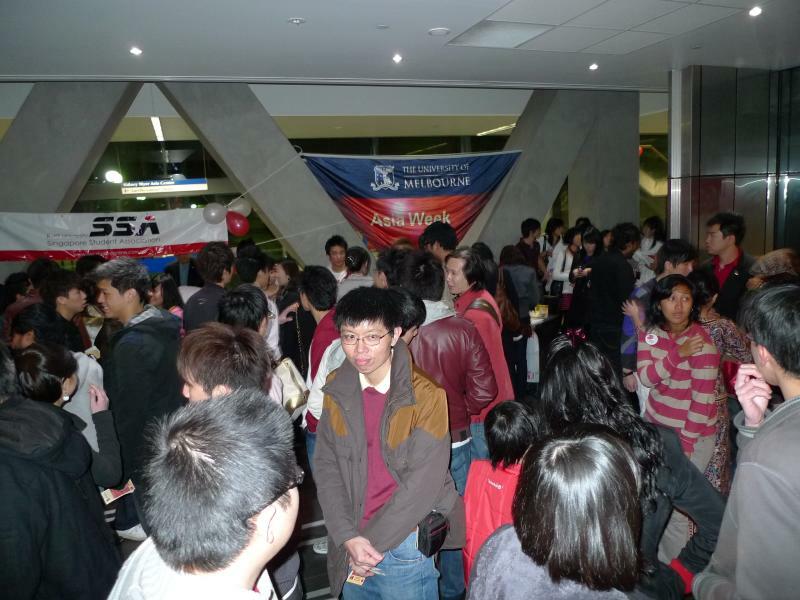 Held at the Sidney Myer Asia Centre at the University of Melbourne (along Swanston Street), the party was a great way to rekindle passions and emotions in one’s homeland. While I haven’t been away from Singapore that long (my last trip back was in mid July 2009), I still feel the pains of homesickness occasionally creeping up on me (especially since my family is there). Which was why I think that its a great idea to have celebrations of Singapore’s birthday in cities with significant numbers of Singaporeans. 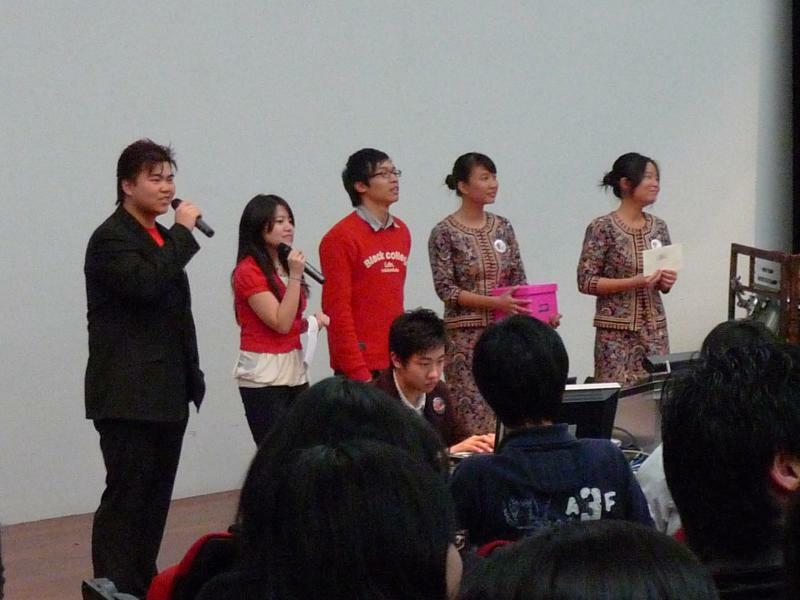 Special thanks must go to Wan Hua who helped made this gathering possible. No prizes for guessing what this ticket to the event resembles! I thought it was a great stroke of creativity. 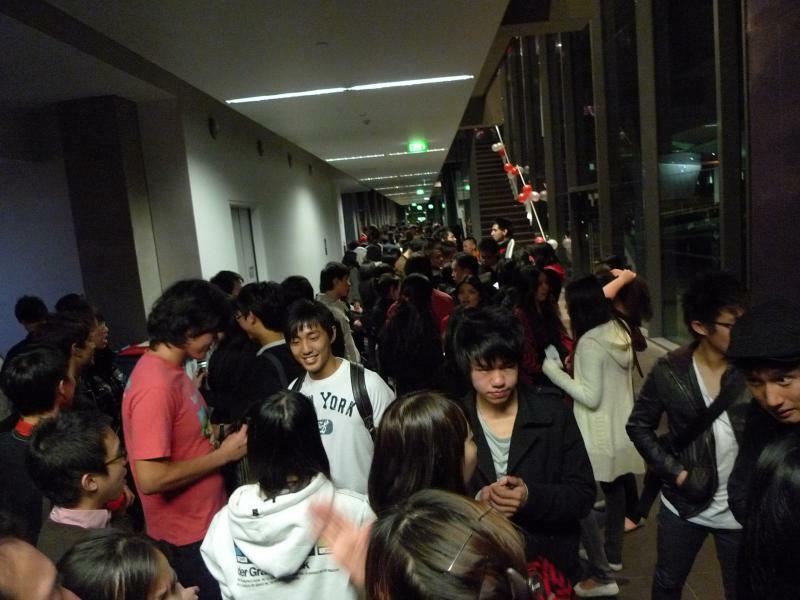 Before we could go in, we had to queue up in the usual Singaporean style while the reception registered us. Lines, complete with arrows, were drawn for people to walk along them. How typical! 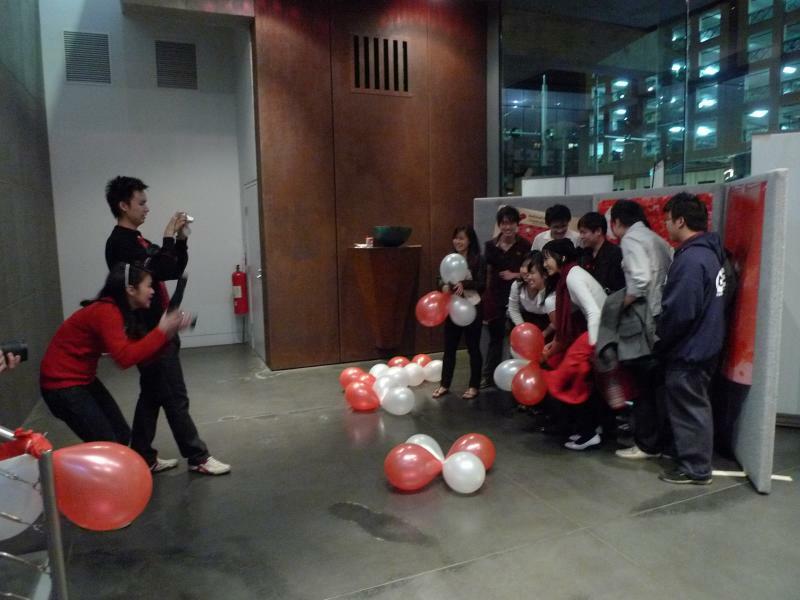 Once we were in, we saw this corner for photo-taking, embellished with red and white balloons and our national flag. Naturally we had to strike a pose too. Here’s the five of us from Graduate House. Smile! 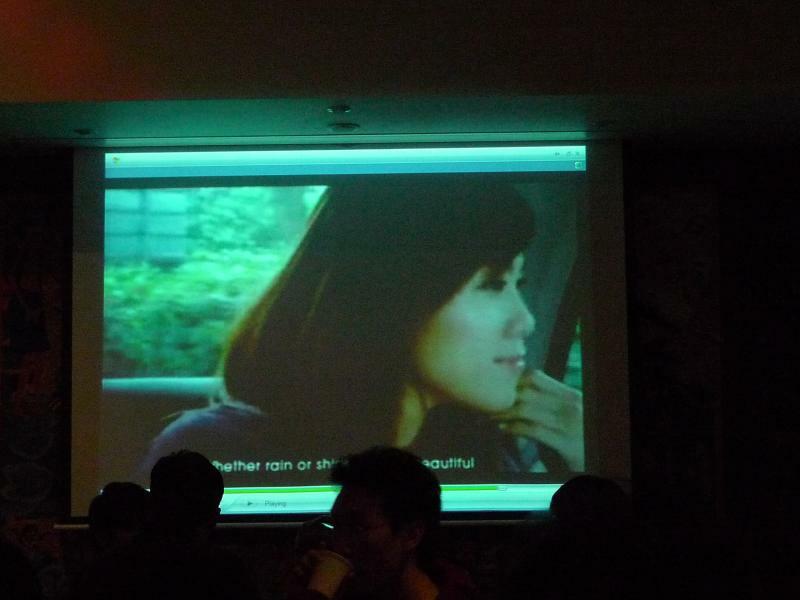 …and a large screen playing the music videos of past and present National Day songs. My favourite is still Home by Kit Chan (which never fails to move me). What’s yours? We finally made it to the food and voila! 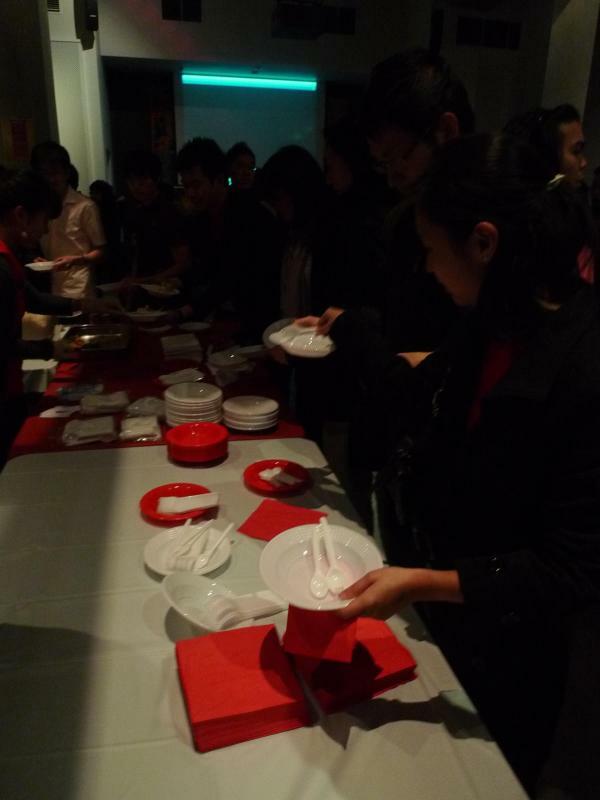 The plates and serviettes were in patriotic shades of red and white. 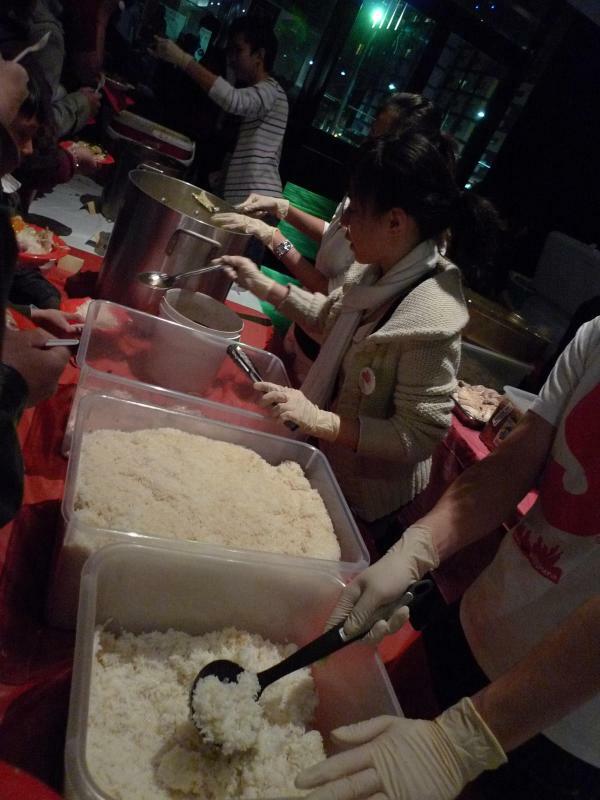 The food (glorious food!) for that night consisted of Singaporean favourites like chicken rice, beef rendang, friend kway teow, curry puffs and spring rolls. There were also some custard like desserts and bandung drinks. Yes, you guessed it! Another queue. This time at the Carrillo Gantner theatre at the basement. 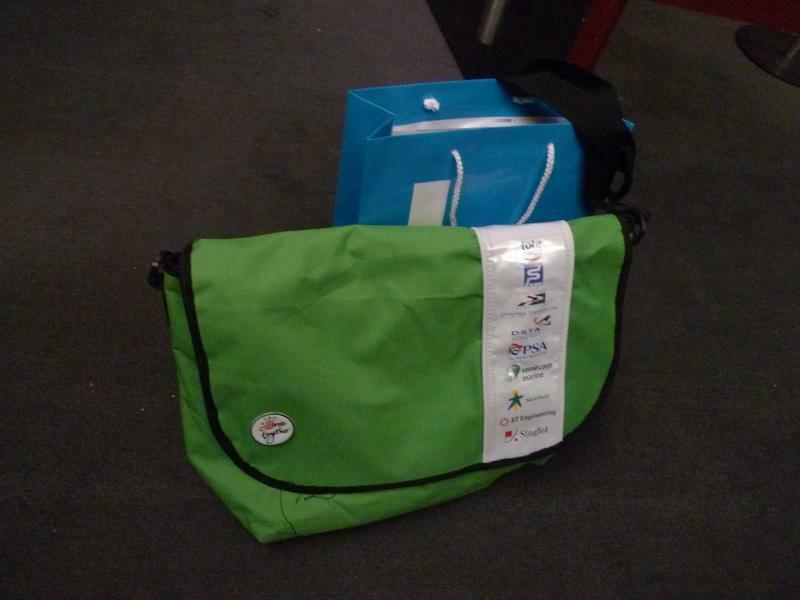 The first thing which we collected at the end of the queue were the two goodie bags. The blue one came from Contact Singapore and the Overseas Singaporean Unit. The green one (which came in four shades apparently of light green, purple, pink and dark green) was the actual one distributed at the NDP itself! 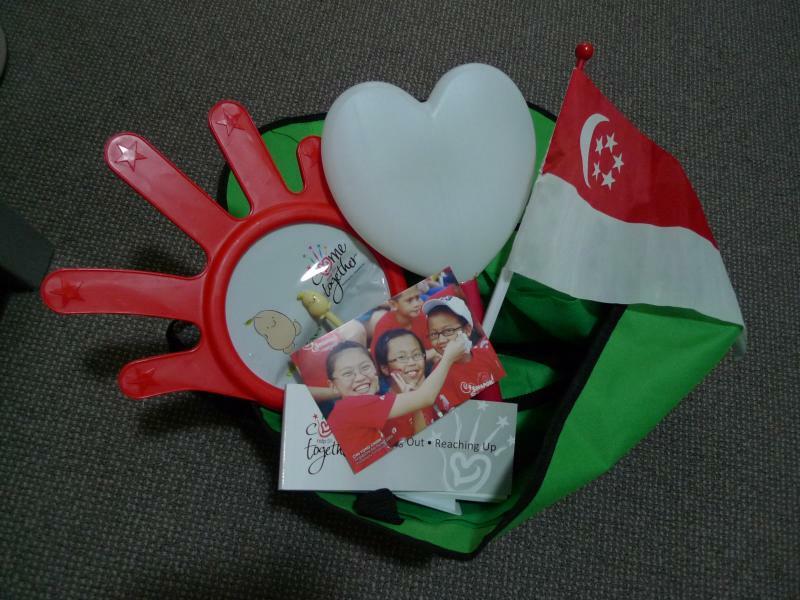 Here’s the contents of the goodie bag, which came with a flag, waving hand, glowing heart, postcards and lots of discount coupons. Unfortunately, we can’t use most of them as we won’t be going back to Singapore that soon. Sob! A blown up map of Singapore for you to put up stars indicating where you lived on the island. 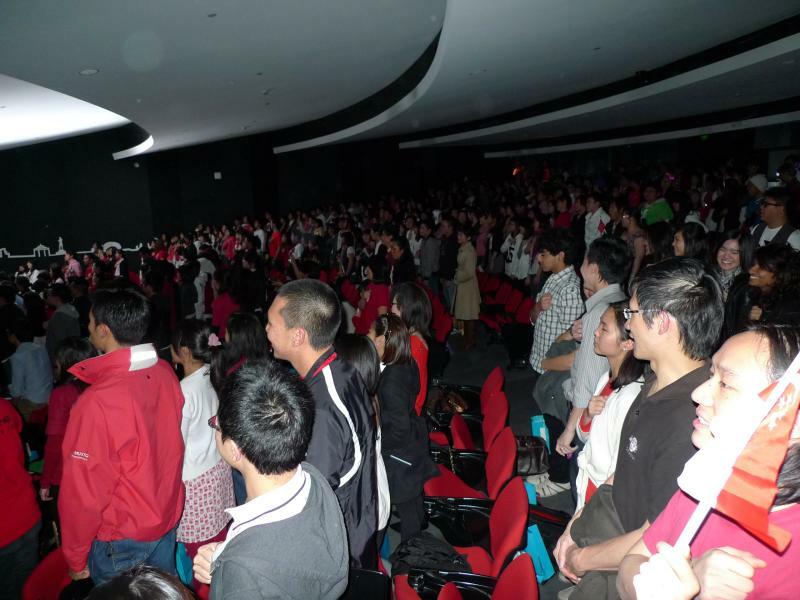 At the theatre, the audience waited patiently as the event proceedings began. 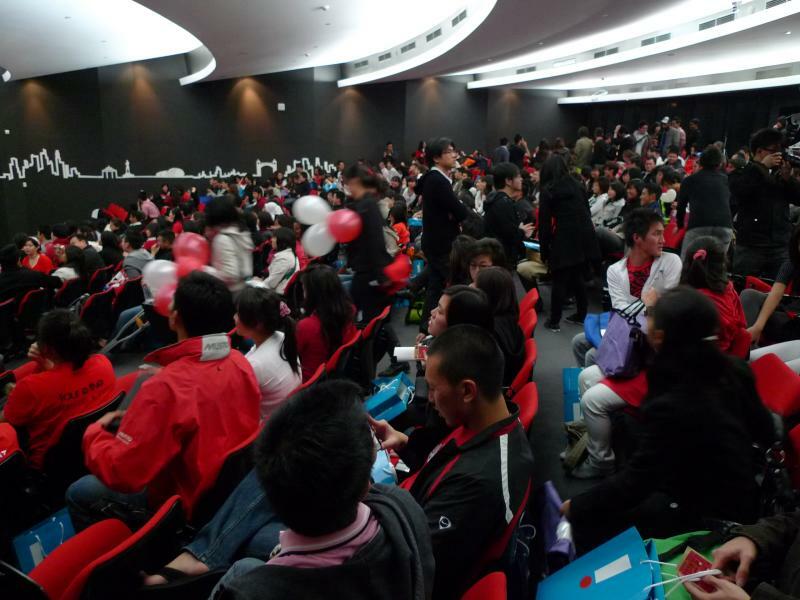 Notice the abundant shades of scarlet and ivory splashed across the room. 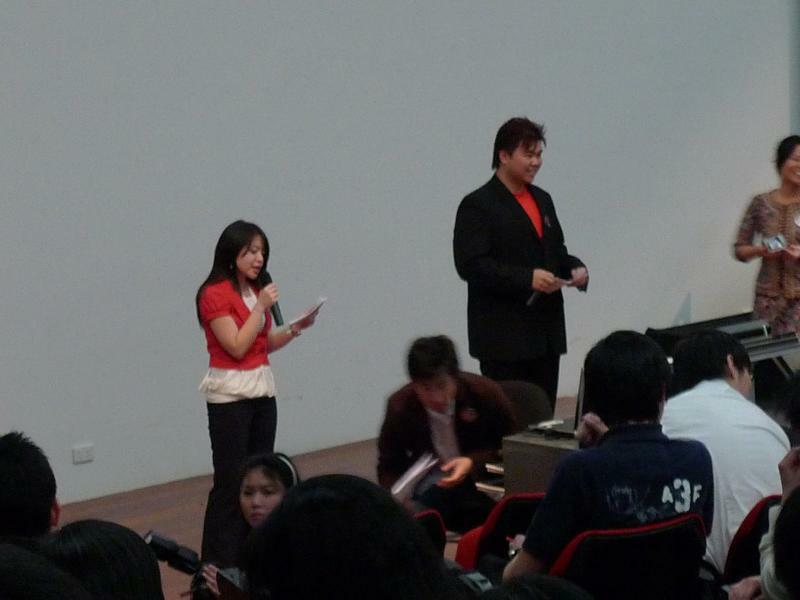 The two emcees for the evening, trying to keep the crowd entertained while waiting for the live screening of the parade to begin. 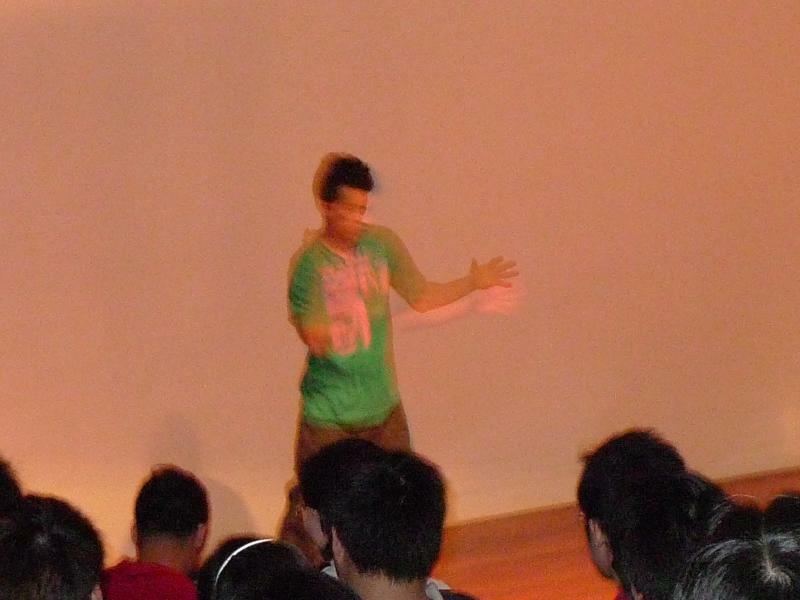 During an intermission, we were treated to performances like this hip hoppin’ dancer doing some serious breakin’ moves. 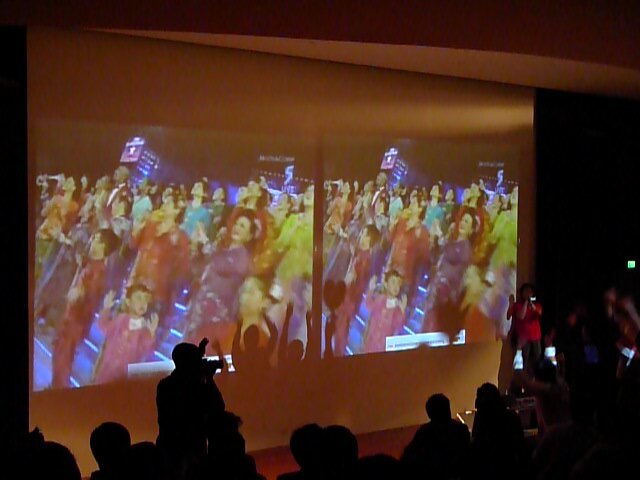 These ladies performed a traditional Malay dance and later led us to sing “Singapura” with the lyrics flashed above. 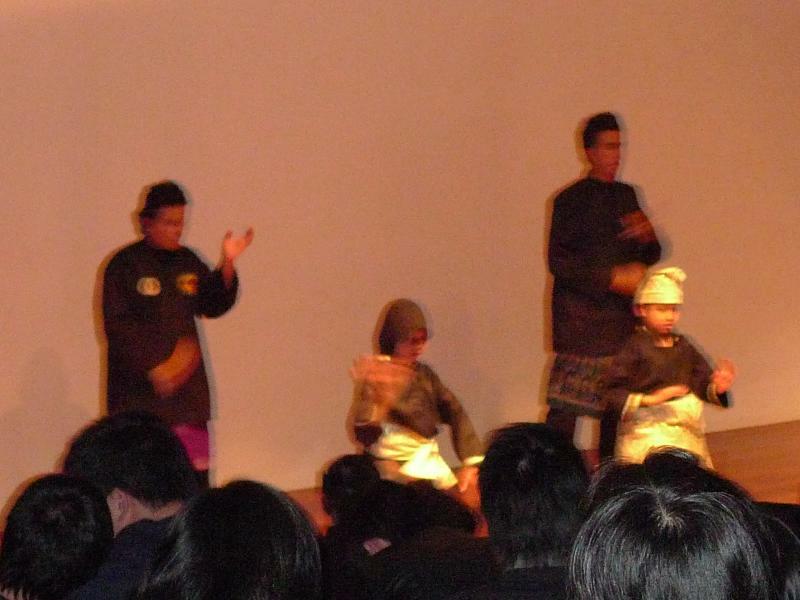 These two kids with their mentors “ooh”-ed and “aah”-ed the crowd with their displays of silat martial arts. 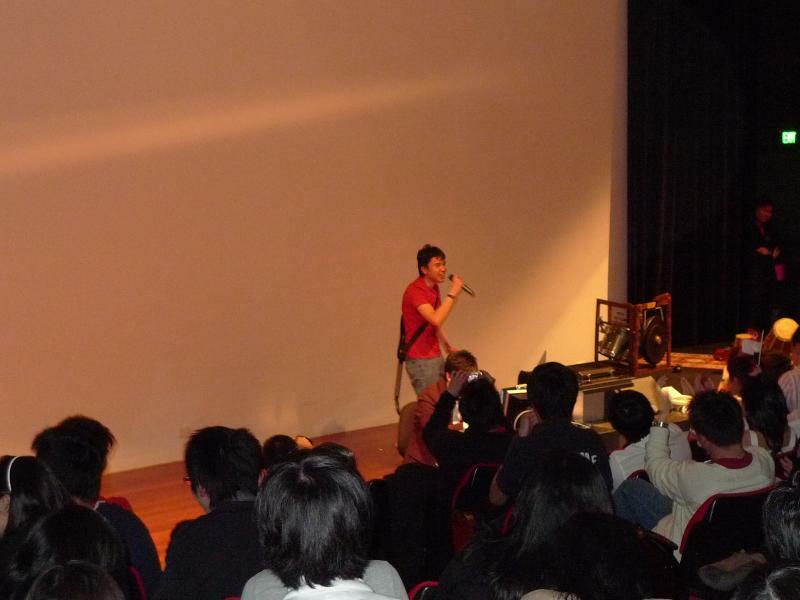 We also “enjoyed” this stand-up comedy act, which was, well…. OK, at least he tried and we should applaud him for that! 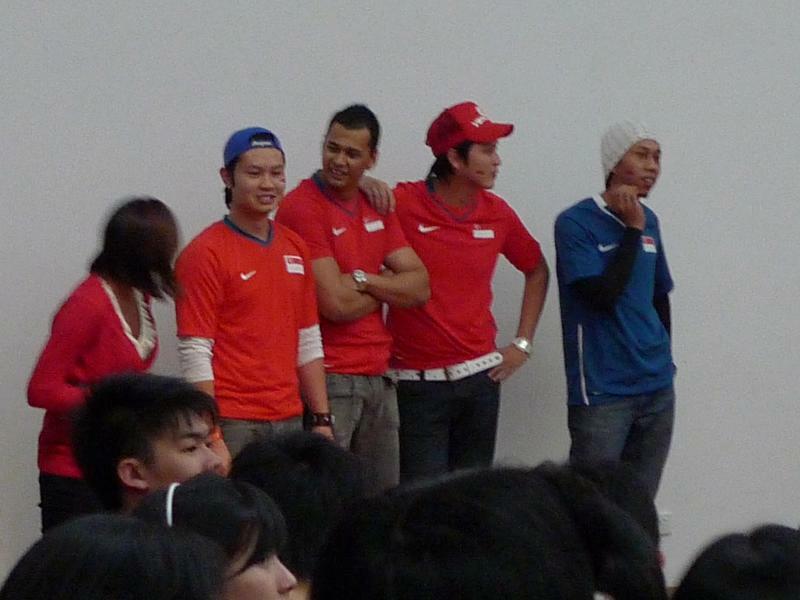 There was also a fancy dress contest, and this group of four dressed like a Singapore soccer team took the honours tonight. 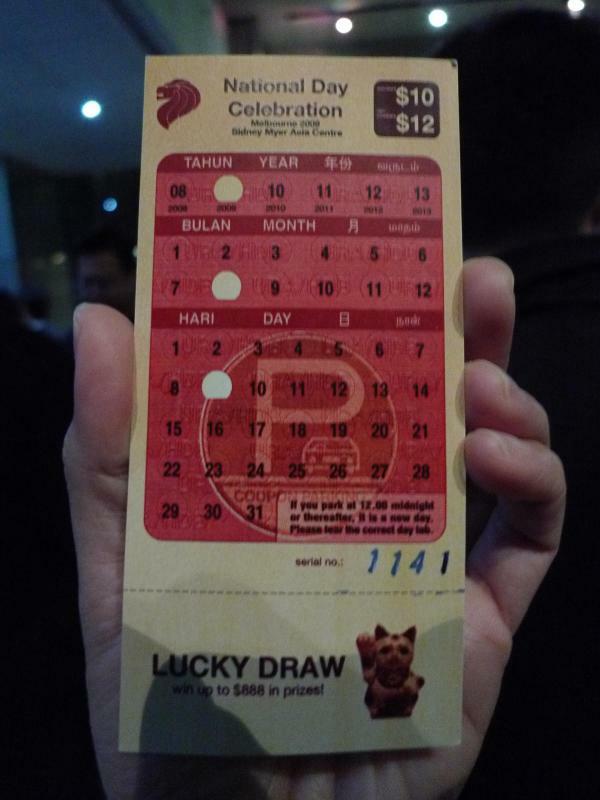 Naturally, such functions must have the customary and crowd-pleasing lucky draw. 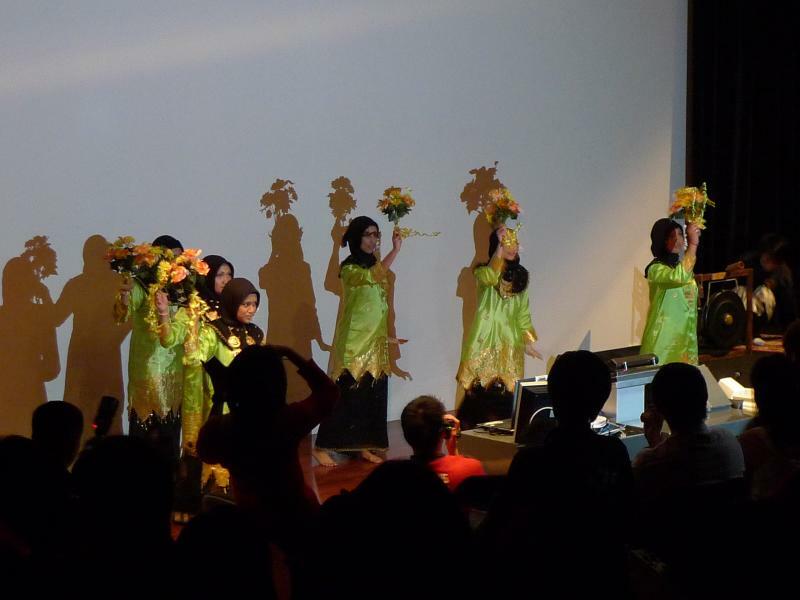 Notice the two lovely ladies dressed in SIA’s Sarong Kebaya – another uniquely Singaporean attire. As the night rolled on, the excitement in the air at the theatre was electric. Everybody was cheering and singing along. 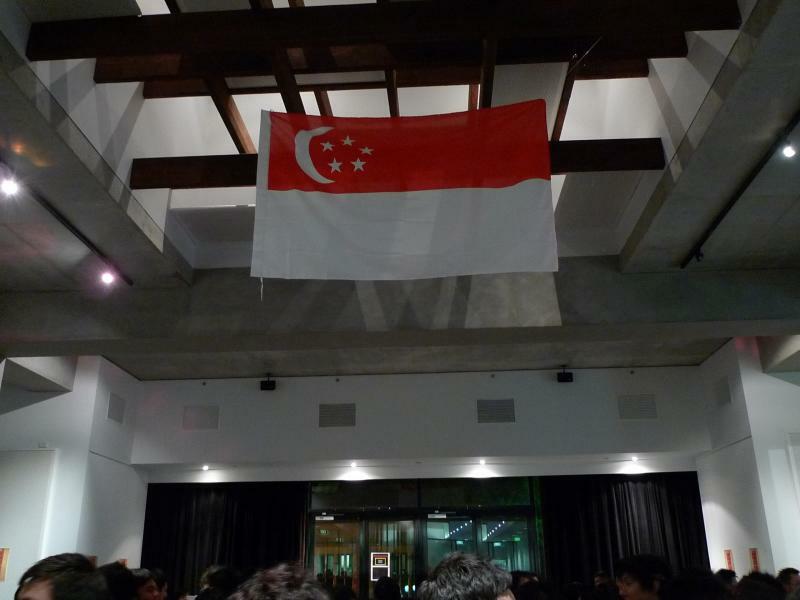 The highlight of the evening was the sayign of the pledge and the singing of the National Anthem, at 8.22 pm Singapore time (which was 10.22 pm Melbourne time). 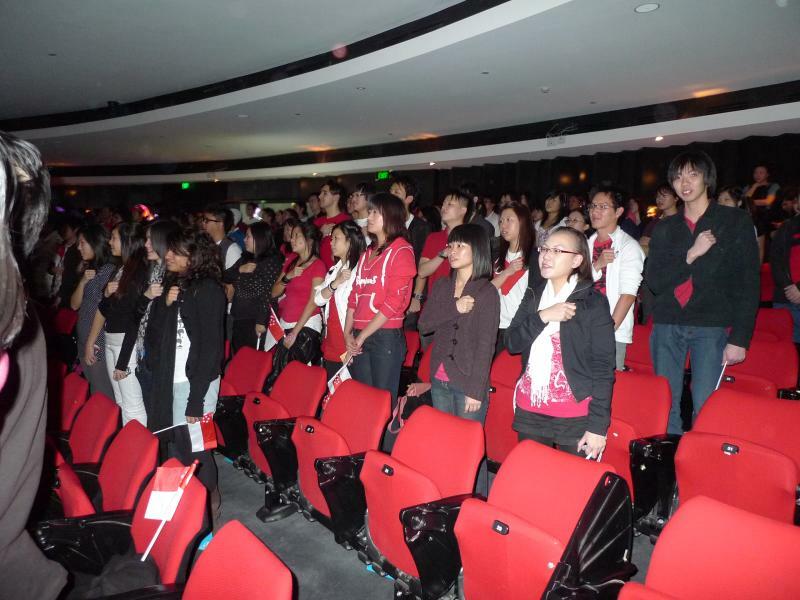 Young Singaporeans separated more than 6,000 km away from home, pledging their allegiance to the land of their birth. 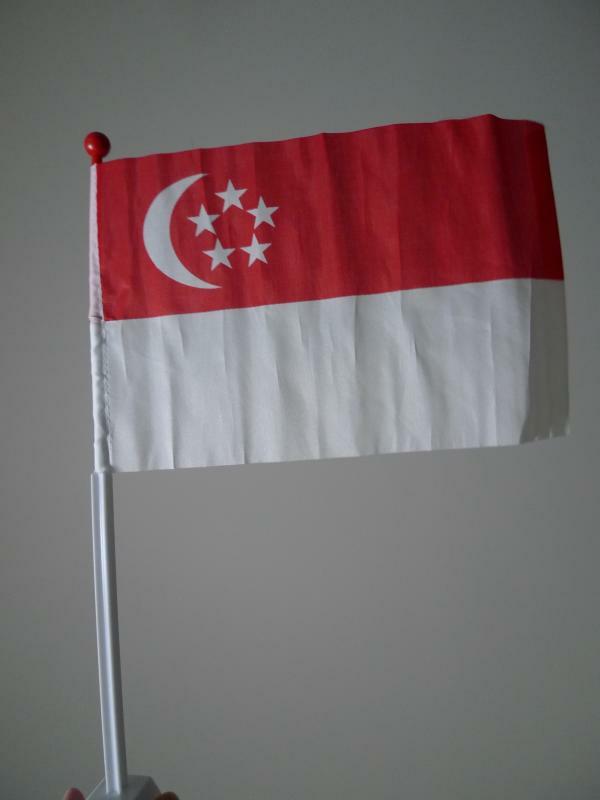 Here’s wishing everyone of my readers, friends and family members a very special and enjoyable National Day!! Hope that you have as good a celebration as I did here in a wintry Melbourne. 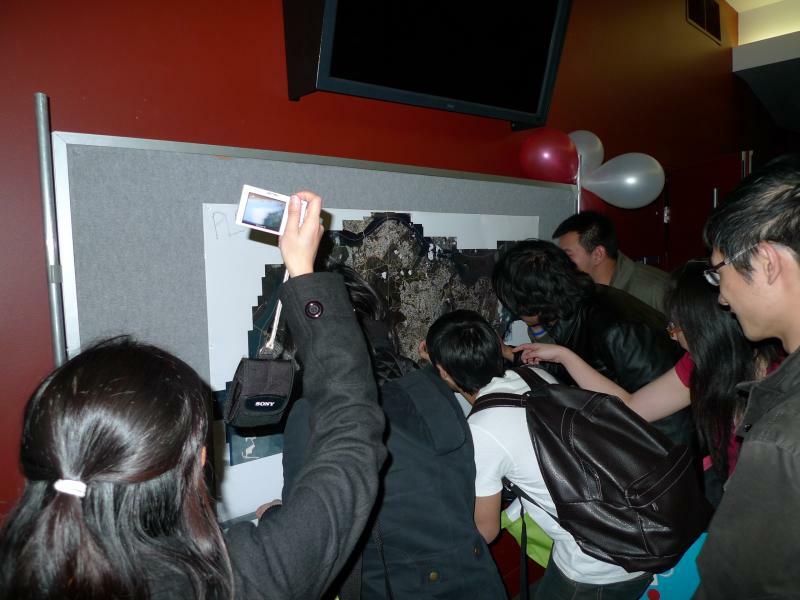 woah that’s cool man…that is some effort they took there and eh..I love the invite card..heh..